Snickers was on a mission. 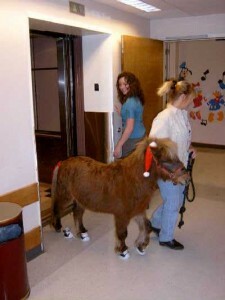 To accomplish this he had to prepare by taking safety measures onto his own hooves. I was in charge of putting on his new black and white, tie in the front sneakers. 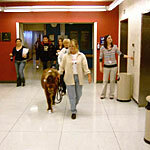 After placing them on and checking to see if our two volunteers had the clean up equipment & camera, Snickers was ready to walk his sneakers into University Medical Center and take the elevator to the 6Th floor. The elevator was not his favorite part of the journey but it was a necessity. It was the only way he could see the children and create the smiles. 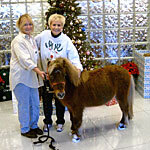 Snickers fell asleep at bedsides as he felt the loving hands upon him from the patients and their family members. He saw age groups from infant (more pet therapy for the parents) to 20 year old young adults. He helped them all to forget for just a moment where they were and why they were there. He helped bring smiles and comfort. Conversation and laughter. Healing movements and the gift of a simple touch from a soft nose. Those sneakers were made for walking and that’s just what they did–that day those sneakers just walked into the hearts of all those who witnessed Snickers and his volunteers in University Medical Center. Mission Accomplished! P.S. Two hours inside and we never had to use the clean up equipment-whew! Wow, Nancie, Snickers is such a PRO! So enjoyable to see him carrying out his missions and wearing his various “hats” to brighten the days of all the fine folks he meets in your “Traveling The Miles to Bring Smiles”!